Do Not Call A Divorce Attorney Until You Order a Free Copy of Our Book! Deciding to end a marriage is painful, difficult and challenging. Sometimes the feeling is mutual, but at other times it is not, which can cause even greater stress. Also, this area of law is very counter intuitive, meaning that you may think something works in your favor, but it does not - Or you may think something does not work in your favor, but it does. The divorce process can be gut wrenching, emotional and fraught with the risk of making bad choices. You don't need to fall into that trap however. The first step is to call us. We understand that a lot of people don't enjoy the idea of calling a lawyer and that is okay. 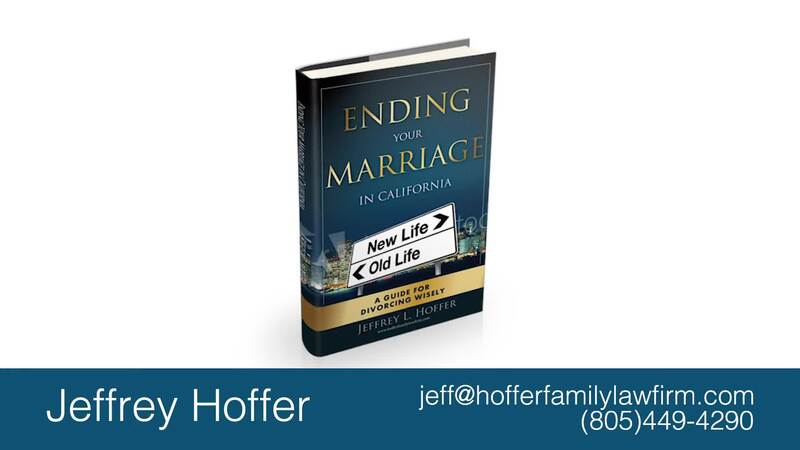 You can always send us an email to [email protected] and order a free copy of Jeff's book, Ending Your Marriage in California. In the book, you will find valuable information that no other divorce attorney will let you in on. The book provides valuable insights on how a divorce might be an ending, but it can also be the start of a brand new beginning as well. We have been going to bat for our clients since 1993. It's stressful to face any of these issues. You shouldn't have to feel you have to do it alone. We provide effective and thoughtful solutions to these complicated situations. Call us today at (805) 449-4290 to schedule an initial consultation so you can learn how we can help you. Call Us Now (805) 449-4290 and let us handle it for you. I believe he’s a good-hearted individual who cares for his clients, and who is honest and sincere.